Tarlton Law Library holds a collection of more than 1,100 early modern legal manuscripts, primarily from what is now the United Kingdom. The earliest date from the fourteenth century and the most recent are from the early twentieth century. The manuscripts vary in size, length, and material. Some are a single sheet of parchment just a few inches across, others are multiple pages on the largest parchment available (about 28" X 33"). Still, others are written on paper. The collection is an aggregate of several private and institutional collections that came to Tarlton gradually over the course of twenty years. Almost every conceivable kind of legal transaction is represented, as are documents from civil, criminal, and ecclesiastical courts. However, the overwhelming majority are property transactions. Spelling and place names are irregular and the handwriting occasionally difficult to decipher, but there are a number of groups of related manuscripts that could provide material for original research. 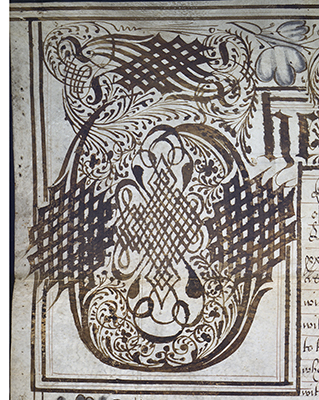 The manuscripts also represent an excellent sampling of English paleography, or handwriting, from the fifteenth through the nineteenth centuries. The collection is one of the largest legal manuscript collections in an academic law library in the United States. The collection was recently re-inventoried and re-processed and Tarlton Law Library is pleased to make these documents available to researchers. The selection of manuscripts featured in this exhibit was not chosen for cohesiveness, but rather as representatives of a very diverse collection. For more information about the manuscripts in this collection, please email rarebooks@law.utexas.edu.